If you were looking for a visually dated way to show you love UBC’s president, the opportunity to do so is upon us. Thunderstruck, the UBC Women’s Volleyball festival, is happening this Friday, February 8 at the War Memorial Gym. 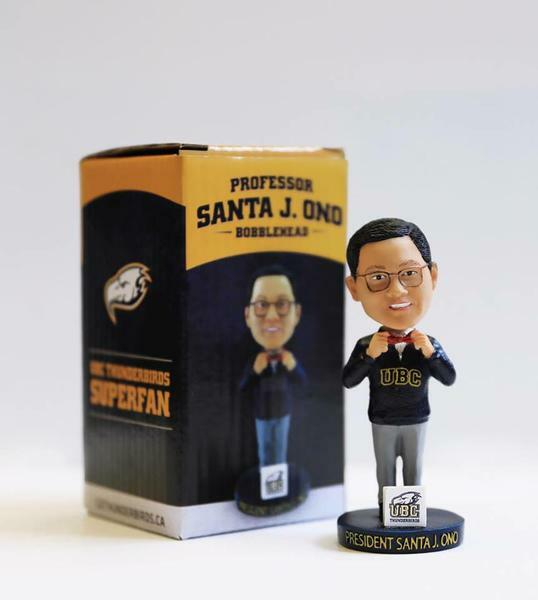 At 5 p.m. when the doors open, the first 300 people through will receive a President Santa J. Ono bobblehead. These bobbleheads are limited edition and they aren’t available at the UBC Bookstore. So if you’re one of the 300 people who is fortunate enough to get one of these, you are part of an elite group. Perhaps you can manifest the professorial knowledge of Ono with these by placing it on your desk and staring into his eyes as they bobble back and forth, or ask its opinions on the bowtie you wanted to wear to class. This bizarre show of love for Ono will surely bring lots of people to the game, so make sure to get there early so you can compete to receive what is probably the most sought-after presidential bobblehead in Vancouver.